Jack Daniel's Tennessee Honey Whiskey wants you to enter daily to win an all access VIP Vacation to the BET Awards where you'll get the chance to hang out with R&B music artist Mila J! 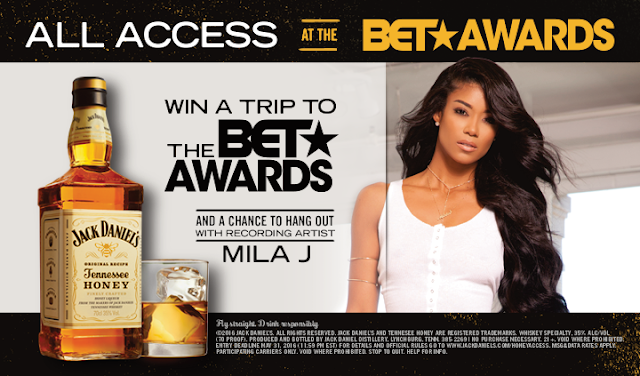 Grand Prize consists of a 4 day/3 night trip for two (2) to the BET Experience at L.A. Live in Los Angeles CA. Prize package includes: two (2) round trip coach class airfare from a major gateway airport closest to the winner’s home to Los Angeles International Airport, hotel accommodations for three (3) nights at a host hotel selected in BET’s sole discretion (one (1) standard double occupancy room, room and tax only), two (2) premium level tickets to the STAPLES Center concert on Friday and Saturday, two (2) loge tickets to the BET Awards ’16, VIP admission to all BET Experience events open to the public and free admission, opportunity to access BET Awards red carpet for photo experience; and $1000 cash (A.R.V. $4,200). HINT: If you prefer to text to win instead, you can send the keyword HONEYACCESS to the shortcode 68405.